Home » who » Am I a Candidate for the Bionic Ear??? Given the media exposure (and popular YouTube videos) of patients getting their "bionic ear" turned on with subsequent tears of joy... it is no wonder that patients disappointed in their "ordinary" hearing aids come knocking on their ENT's door desiring a bionic ear as well. Otherwise known as a cochlear implant, the device is actually implanted through the skull and directly into the cochlea rather than placed on the outside of the ear (watch video). 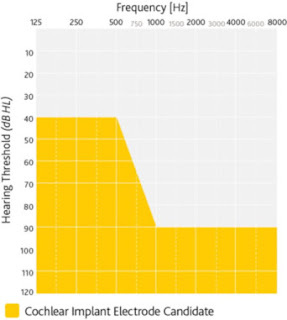 Unfortunately (or rather fortunately), there are very strict guidelines on which hard-of-hearing patients are eligible for a cochlear implant. The rough rule of thumb is if a patient is NOT able to understand conversation over the phone while using a hearing aid, they might be a candidate. Patients must keep in mind that cochlear implant does NOT restore normal hearing... it basically makes someone with bad hearing have improved, but not normal hearing. 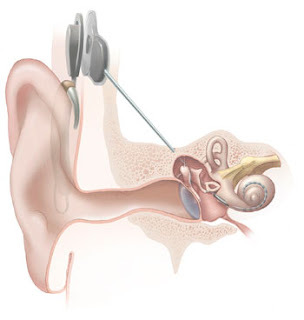 Furthermore, the sounds are quite mechanical and artificial lacking depth and simulations of what the cochlear implant hearing is like can be quite jarring. Listen to an audio simulation here. Typical preoperative hearing of candidates ranges from normal to moderate hearing loss in the low frequencies (thresholds better than 60 dB HL up to and including 500 Hz) and Severe to profound mid to high-frequency hearing loss (threshold average of 2000, 3000, and 4000 Hz ≥75 dB HL) in the ear to be implanted. The CNC word recognition score criteria are between 10% and 60%, inclusively, in the ear to be implanted in the preoperative aided condition. The contralateral ear’s CNC score criteria are equal to or better than that of the ear to be implanted, but not better than 80% correct. 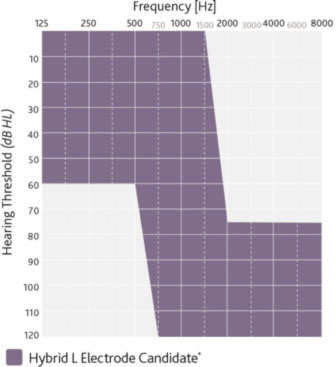 Moderately severe to profound mid- to high frequency hearing loss (threshold average of 2000, 3000, and 4000 Hz ≥ 60 dB HL) in the contralateral ear.